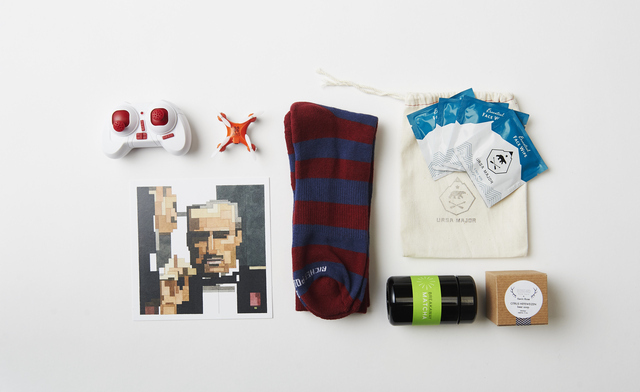 Home / Holiday Gift Guide 2015 / Quarterly Subscription Box Gift for Men! Quarterly Subscription Box Gift for Men! When we started looking at what we wanted in our Gift Guide this year a few things really stood out to me, and this box from Quarterly was one of them. I loved that they had different people doing different boxes and that they had a mens box, a women’s box and a book lovers box. I believe that those are some pretty good categories when it come to subscription boxes. When the box came it was packaged nicely and when I opened it up I did not see a box of stuff just shoved in, I saw a gift. All of the products were packed in such a way that it looked like they sent me a gift. You could easily just wrap this and give. Very neat idea! Inside the box were some great striped socks, some beer soap that smells amazing by the way, a little remote control drone, (the dog loves this) some facial wipes that you could between work and a date, or on the way to a meeting, Some matcha tea and for extra manliness a really neat framable picture of “The Godfather”. You could tell that it was packed or curated as Quarterly calls it by a well-rounded man who knew that most men were going to like the things in here and find them useful. They were not going to be things that just got left in the box and moved from place to place. My son was so excited to dive into the new socks and play with the drone that he almost could not decide which to do first. My oldest is 28 years old and he loved this box! He felt like it hit on all of the things he would like to get, a toy, something warm, some soap, something to drink, and a cool picture. Aren’t these the things that every young man dreams of? Well he loved it! I did too, it would be great to give to a brother, an adult son, a co-worker, your husband, and maybe even your dad, depending on age range. You can purchase this box here and as the name Quarterly suggests these are sent out quarterly to your gift recipients. You can buy one or a years worth, and each box is put together especially for them. I highly recommend these boxes for gifts, they are easy to buy, easy to wrap or send directly to recipient and are so fun! Quarterly Box Giveaway - Here We Go Again...Ready?